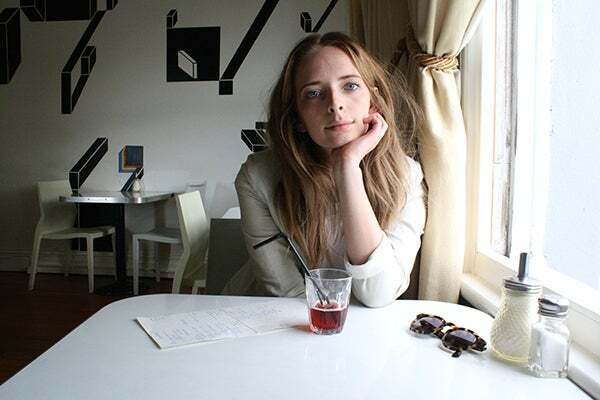 Having recovered from what she describes as a "dismal art-school experience" and floating through New York and L.A. on musical voyages, musician and artist Chelsea Jade Metcalf is back in her native New Zealand. She's no stranger in fashion circles, especially since she performed live at Fashion Week, in addition to being regularly dressed by some of country's leading designers such as Karen Walker and RUBY. The music video for her latest single "Pazzida" was funded by the $10,000 she won at last October's Vodafone Music Awards. And, it's also doing nothing to distract from the notoriety she's gaining as one of New Zealand's most interesting young talents. We sat down with Jade to find out more about her insights on fashion, photography, and, — yes — CW TV shows. "Being easy and alone atop a windy rooftop ferry." What began your love affair with New York? "It is unlikely that the answer strays further than any number of '90s romantic comedies. All I know is I would have feverish dreams about the place when I was young. The second time I went, I was alone, and it was a life-alterer. Soaring highs and perilous lows." "I have felt quite nomadic having not grown up in the country of my birth and I’ve only recently realized how desperately I love the wild coastlines of New Zealand." Can you share with us an early memory of making music? "I had tap shoes secured to my feet until my early teens." Where do you think fashion and music meet? "[It's] where the visual language adjacent to sound begins to require a voice. I love thinking about aesthetics and cohesion. Garments — maybe moreso than fashion — have contributed to my understanding of how I want my music to be experienced — especially in a live capacity. Lately, I've been wearing a cream Liam pantsuit to play, whilst the wonderful women who lend me their lungs have been adorned in floor-length cream gowns from Miss Crabb. I don't like to look too fussy, but there has to be additive purpose and a bit of splendor to behold." What's the biggest hindrance to your creativity? "Feeling inadequate or unproductive! Indulging in crippling comparisons to other music-makers and binging on bygone television shows as avoidance-flavored medication. This is a love letter to you Roswell/Gilmore Girls/Popular! If anyone has any suggestions for ‘further reading’ into the realm of TV-based procrastination, they are welcomed." You take beautiful photos that we can see on your blog, when you can afford to develop them.... What makes shooting on film still worth the expense and hassle? "Film is tactile, and you are more than forgiven for being precious about each frame when each roll holds such limited quantities. My attention span is terse, and I couldn't stomach the prospect of major trawling even though I do love digital photographs. As music has occupied me more and more, I've turned to disposables for a similar but more abbreviated experience of memory banking. I took a few to Japan when I stole away on short notice and had very little room in my backpack. They did just the trick."